The opening 30mins of this picture is admirably conceived and executed. Gerry Lane (Pitt) and family in a car, logged jammed in traffic feel the quiet dread of something monumental about to happen. A build-up fashioned after say, the introduction of the T-Rex in Jurassic Park, which in itself was a fashioned after the Spielberg’s suspenseful resurrection of the shark in the third act of Jaws – a scene misdirected by an innocent family fun and peacefulness to a violent disaster movie action sequence. In this case, a zombie invasion of sorts in Philadelphia downtown traffic. The situation immediately turns into a post-Apocalyptic scenario, chaos in the streets, anarchy, looting and every-man-for-himself survivalism. Along the way expositional information is cleverly conveyed to us, specifically the global-range of the zombie threat as well portraying Gerry Lane as a former UN officer specializing in hostile environments who has taken a desk job to be with his family. Once safely in military custody aboard an aircraft carrier Gerry is given his choice of the lesser of two evils: stay and protect his family, but not aboard the carrier or lead the global investigative team, leaving his family alone, but in the safety of the military. Choice B is an easy one, and soon Gerry is aboard a plane for mission which takes from South Korea to Israel to Russia and Wales to find ground zero and perhaps a solution to this mess. Even after 45 years of zombie films we have never seen the effect of this kind of a viral disaster with this kind of scope. Forster and company (and as documented in the press it was truly a creative mélange beyond simply one director’s vision) admirably executed this scope with a half a dozen impressively mounted action sequences, each with their own visceral flavour. The opening scene focuses less on the zombie threat than the fear of the unknown. The massive Israeli sequence reveals the remarkably conceived animalistic force of the zombies as whole, showing its onslaught like a predatory wave of bees, piranha or ants. The sight of the hordes of mindless zombies climbing over one another to scale the Israeli-built wall of protection is stunning – and delightful surprise from the spotty directorial experience of Marc Forster (Monster’s Ball, Quantum of Solace, Kite Runner). And the finale is an intimate suspenseful cat and mouse straight out of the early Ridley Scott oeuvre (Duelists, Alien, Blade Runner, Black Rain). The narrative unfortunately cannot hold the weight of its own conceptual desires. 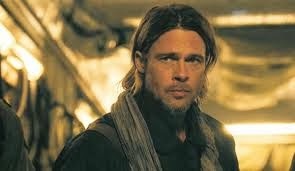 The film has to resort to some plotting conveniences to constrain the investigation to the movements of Brad Pitt’s character. For example, we’re told the Israelis anticipated some kind of viral spread and immediately built a massive wall around the city. And when the zombies eventually scale the walls, attracted by the chanting of the Islamic refugees, Gerry Lane happens to be there and happens to be the first one to see the breach. A parallel story of Lane’s family left to their own devices aboard the aircraft carrier remains a loose thread, presumably cut loose from its much documented reconception in post-production. The film has to resort to a War of the World’s scenario, finding a simple antidote which would cure the world. Unfortunately the film never gets better than those few moments of CGIed zombie-flow through the streets of Philadelphia, Jerusalem et al. Considering the early prognosis of cinematic death reported by the blood-thirsty press prior to its release, World War Z is a unique and admirable addition to canon of zombie pictures.